This is my new favourite fancy party dish, the one that will wow my guests and have them think I am some sort of culinary Goddess. This is my new favourite, "Look T! see what I made for lunch!" dish. I may even make it for breakfast, infact this might be the biggest motivation to get up in the morning! What it is- layers and layers of soft, spongy crepes with a spicy masala / or sweet cardamom scented coconut and raisin filled in between them. Malayli's Lasagna is definitely the best description for it! When I first encountered this on Ria's blog, I just about fell off my chair. What was this strange creature? I had never heard of it before, much less tasted it. My faith in my knowledge of Kerala cuisine-( the food of my people, the one I grew up on for crying out loud!) was shaken. It was at that moment that I realized that what I knew was probably just a drop in a vast sea of culinary treasures. There was so much more to learn about it, the cuisine of one tiny state, in a vast country of contrasts. 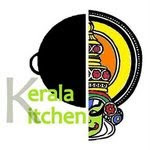 That was when The Kerala Kitchen- a monthly cooking event featuring dishes inspired by Kerala, was born. Along with Ria, and our wonderfully talented members, we are on a mission to rediscover the cuisine of Kerala. To learn and share what we learn, but most of all, to have fun, to cook and eat some really good food :) Join us! For our very first Kerala Kitchen Challenge- to take us out of our comfort zones and attempt a new dish we may not have tried before, it had to be the Chatti Pathiri, which was was new, strange and exciting, not just to me but to many Malaylis who were not so familiar with the Malabar cusine. I used Ria's recipe, but wanted to try it with Whole Wheat flour and coconut oil and I have to say, it is one of the best things I have ever made! Thanks again Ria, for another great treasure! Ria prefers the AP version, so I suggest that you try it with AP flour too. We love whole wheat flour and love the nutty, rustic taste of it, but Ap flour will yield even softer results. You can also make the Chatti Pathiri with vegetarian fillings and I have mentioned some suggestions. This can also be made with ground beef instead of the chicken. Equipment: You can make the crepes in a flat bottom pan like a non stick/cast iron skillet/ Dosa kallu and you will need a cake pan ( if you plan to bake it) or a mid size (8 inch) sauce pan ( If you plan to cook it on the stovetop which is what I did) Basically the size doesn't really matter- make the crepes about the same size or slightly larger than the saucepan/cake tin.Do not use a cake tin/ sauce pan that is much larger than the crepes, otherwise the layers won't stack as neatly. Heat oil, add the onions and saute it till transparent. Add the ground/minced ginger, garlic and green chillies and stir for a while. Add the cooked minced chicken ( Or cooked vegetables if using) and mix well. Add in the powders and chopped coriander leaves and mix well. Check for salt.Drizzle the ghee/coconut milk, mix well.Keep aside. Whisk together the flour, salt , egg and enough water to make a smooth , not-so- thick batter. Line your work area with newspaper or parchment paper. Heat a flat bottomed pan/ nonstick/cast iron skillet/pancake griddle/dosa kallu, pour a ladle full of batter over it and make thin crepe/dosa/pancakes out of it. ry and make the crepes about the same diameter as the cake tin/saucepan you will be layering it in later. They don't have to be perfect, slightly bigger than the cake tin/saucepan is ok. Try not to make them too small or too thick. If you rip some a little don't worry, you can still use them. Do not flip, just cook on one side. Mix the coconut milk and coriander leaves together. Take a crepe/dosa/pancake and dip it in the coconut milk ( don't dip for more than 2-3 seconds, as it wil get soggy and might rip off) and put in the pan. Sprinkle some filling over it. Cover it with another coconut milk-dipped crepe. Repeat till the crepes and filling is over. You can dot some ghee/coconut oil in between each layers too. Pour the remaining coconut milk over it. It may or may not cover the whole assembly of pancakes. Put the saucepan over medium-low heat and cook till the coconut milk is absorbed. If you are baking, pre-heat the oven to 180C and bake till the coconut milk is absorbed. Invert a plate/serving dish over the saucepan/ cake tin. Then holding the plate firm against the mouth of the tin/saucepan, flip the tin/pan so that it is now resting on the plate. Carefully remove the cake tin/saucepan. Look at the wonder you have created and pinch yourself in case you think you are dreaming! Serve immediately so that it is still warm. I put the left overs in the fridge and the next day it was a little dry. This however, made it even easier to cut into neat slices. Then I reheated the slice in the microwave and it was soft and moist again. The whole wheat gave the crepes a rustic, nutty taste (vaguely like rotis and paranthas) and made this very, very filling. After two slices, we were stuffed! The coconut oil was a wonderful choice as it complimented the coconut milk to give some strong Kerala flavour. If you don't like the taste of coconut oil- then you are clearly not a true Malayali :P In that case use ghee or melted butter instead. If you have left over crepes and filling- make Khatti rolls, by putting a generous amount of filling on a crepe and rolling it to encase the filling inside. Thanks Divya and Reshmi :) It is very simple! Come try it with us this month at the Kerala Kitchen. Lovely!!! The pics definitely are gorgeous! The 12 layers definitely does intimidate me. Can we reduce the number of layers to 4 or 5? Yes, of-course I am a good member. I am definitely going to make it. But I am scared about the outcome. I can't accept any flop shows in my kitchen !!! I love the all new look of Kerala Kitchen !!! Hey magpie, you are done with the challenge- already?!! It looks wonderful, loved your shots too! its does sound elaborate but looks absolutely delicious..
Must try it with AP Ria, but we have a sort of acquired taste for whole wheat I guess so T and I loved it! The crepes had a earthy sort of parantha/khatti rolls type taste and the filling is so yummy too! @Sarah- don't be a Madichikutty! if you can make 4-5 you will feel like doing more and more!until there isn't any space left in the pan! I'm telling you all- it's much easier than it looks- if I the queen of Madichis can do it, you can surely top it! @Nashi- coming from you Ms stunning photos- that means a LOT! thanks! Am trying to prop and style my shots now a days instead of clicking them while they are still on the stove or on my plate! @ An open book- hehe we have a Corelle outlet near where we live- my whole kitchen is furnished by Corelle/Pyrex now! Fantastic attempt. Have never seen anything like this. I have to try it,though am slightly intimidated. I wanna make this Sometime..Looks absolutely delicious..!!! This is a very delicious Keralite dish and it has come out perfect... Love ur blog... glad to follow..
Lebni (strained yogurt) Tart for Spring!